The first-year hitting coach peered over across the diamond to the adjacent field to take stock of one of his many pupils already at work in Clearwater, Fla.
Matt Stairs, the only player from the 2008 World Champion Phillies that will wear the team’s uniform in 2017, albeit as a member of the coaching staff, watched Nick Williams, a mercurial outfield prospect who came to the organization in the blockbuster trade that sent World Series MVP Cole Hamels to Texas. Who are the best players on each local sports team (according to #PhillyRank)? Stairs, who played in the big leagues for 19 years, will have his work cut out in his first season as a coach. The Phillies had the worst offense in baseball last year (last in runs scored and OPS, second-to-last in OBP). They also had the worst OPS in Major League Baseball in 2015 and the second-lowest OBP. The Phils haven’t had a team OBP north of .306 since the 2012 season. With that said, there are plenty of areas where the team could stand to improve, perhaps most obviously with the young and developing players who already have a decent chunk of big league time. And with an outfield that, beyond Odubel Herrera, has been downright dreadful during the aforementioned four-year period. But, as the Phillies move into Year Three of their rebuild, the single most important thing they need to happen, in order to see that rebuild through and return to regular contention, is for a handful their growing group of prospects to hit. And “hit” works both ways: both in the baseball jargon regarding prospects (think of holding a lottery ticket, and hoping at least a couple of your numbers match the winner) and in the literal sense (you know, they reach base enough to keep a regular job in the big leagues upon arrival). Jorge Alfaro hit .285 with a .783 OPS in 97 games at Double-A Reading last season. But he's also struck out 597 times (with just 117 walks) in 550 minor league games. In order for the Phillies to get where they want to go, they need J.P. Crawford to not be Domonic Brown, and need a few guys from collection Williams, Jorge Alfaro, Dylan Cozens, Roman Quinn, and Rhys Hoskins (among others) to pan out, in addition to the young prospects further down on the farm (like Mickey Moniak and Cornelius Randolph). The odds are against everyone succeeding, but among that group, the organization absolutely has to churn out some productive major league regulars. Alfaro, 23, also arrived to the Phillies a year and a half ago in the Hamels trade. He is expected to begin the season at Triple-A, along with the 23-year-old Williams. If the Phillies want to look back one day and truly say they “won” the Hamels trade, they are going to need at least one of those guys to fulfill their potential and turn into big league regulars. But that’s unlikely to happen in the first couple months of the 2017 season, or at least until both Alfaro and Williams improve their skill sets as hitters. Alfaro, who hits from the right side, certainly did not have a bad first full year as a Phillies prospect: he hit .285 with a .783 OPS, and 15 home runs in 97 games at Double-A Reading. But he also struck out 105 times in 435 plate appearances and walked just 22 times. In seven minor league seasons, Alfaro has 597 strikeouts and 117 walks in 550 games. The left-handed-hitting Williams did have a down year in his first full season in the Phils’ system, batting .258 with a .287 OBP in 125 games at Triple-A Lehigh Valley. And, like Alfaro, he collects a lot more strikeouts than walks (136 K, 19 BB in 527 plate appearances). Williams had just one walk in 46 games after the All-Star break last summer and has compiled 373 strikeouts and 76 walks in 356 games in the last three years. According to Stairs, it could very well be as simple as correcting mechanics. Both hitters (and the first-year hitting coach) have already been hard at work at the Carpenter Complex, where the Phillies will hold their first full-squad workout on Thursday. 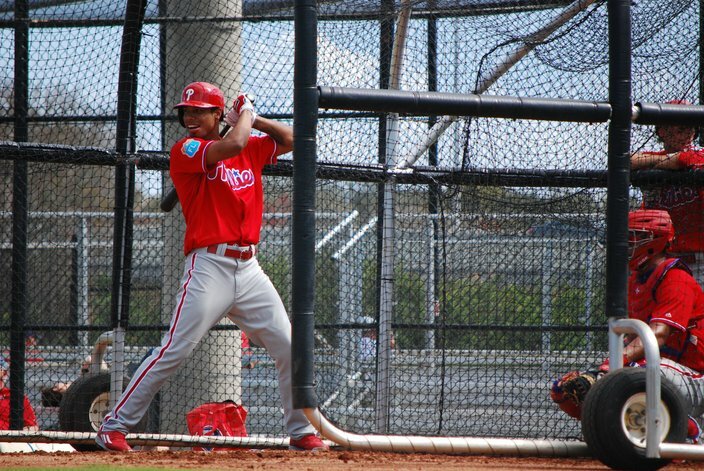 Stairs first began working with Alfaro in January, when the budding catching prospect was at Citizens Bank Park for the Phillies annual prospect seminar. Alfaro was relying too much on his upper body and not putting enough trust in his hands, according to Stairs. And with Williams? Stairs had a somewhat similar diagnosis: his mechanics (beginning with a hard leg kick) weren’t giving him a long enough time to recognize the pitch. Nick Williams stumbled in his first full season with the Phillies in 2016: he had 136 strikeouts in 125 games at Triple-A and, after the All-Star break, had just one walk in 46 games. So Stairs began a fun drill: he asked Williams to take some dry swings but stuck his own foot down where Williams’ metal-spiked cleat would land. Stairs is a big believer in having his hitters stand in the box during pitchers’ bullpen sessions, so they can mimic taking a pitch and, thus, improve their own pitch recognition. As with a pitcher's goal in the same side session, repeating his delivery, it’s all about repetition and training your body over and over until it becomes natural. Neither Alfaro nor Williams are going to become walk machines overnight and they probably aren’t even likely to become the disciplined hitter Stairs was (a career .356 OBP) in his own career. But if they’re able to cut down they strikeouts by, say, a couple dozen in 2017, and learn to take more regular walks, each will take important steps as prospects with realistic paths to the Phillies lineup.